Thousands of people in England with a chronic form of liver disease are being denied access to life-saving drugs that are available to patients in Wales, Scotland and Northern Ireland. The move has dismayed health experts and liver disease charities who say it will mean a large subset of the sickest and most at risk patients in England will not receive the treatment they need to prevent them from potentially fatal liver failure or cancer. They have urged Nice to rethink and take into account the results of trials as well as clinical practice that, they say, have proved the drug's efficacy against a disease that is estimated to affect more than 200,000 people in the UK but remains undiagnosed in tens of thousands. Hospital admissions and deaths due to hepatitis C, a virus spread by contact with infected blood that infects the liver, are predicted to continue rising in England until around 2030, according to health officials. About a third of people infected with the virus eventually develop cirrhosis, where normal liver tissue is replaced by scar tissue. 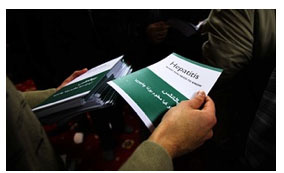 A few people with chronic hepatitis C and cirrhosis also go on to develop liver cancer. Last year the European regulator approved Daklinza for use, in conjunction with other drugs, as a treatment for four main strains of hepatitis C genotypes. But Nice has not recommended it for the treatment of patients with the genotype 3 of the disease, which accounts for around 45% of all cases in England. People from south Asia are particularly affected by the genotype 3, which causes an aggressive form of the disease. Current alternative treatments for genotype 3 cannot be given to people with the most advanced forms of the disease because of their toxicity. They can also result in hair loss and flu-like symptoms that discourage people from completing the full course, or even seeking treatment in the first place. Nice, which is consulting on the use of Daklinza, says that prescribing the drug for genotype 3 patients is not cost-effective. A full course of Daklinza can cost up to 48,700. But Dr Anna Maria Geretti, professor of virology and infectious diseases at the University of Liverpool, said studies had shown that, when used in combination with other drugs, almost 100% of patients taking Daklinza were cured. She said studies in 2014 of nearly 500 patients in the UK at 17 centres had also shown that it worked better than alternative treatments. She said: "Nice has left us with a situation where we are not able to follow the European guidelines, despite them making a strong recommendation. We are not able to offer treatment to a substantial proportion of our patients with genotype 3 who need it and cannot take the more toxic therapy." She suggested that up to 1,000 people in England could benefit from the drug, although Nice is understood to put the figure at nearly 3,000. "My message to Nice is that I would like the evidence coming from our experience of treating nearly 500 people with very advanced hepatitis C infections - including over 100 with genotype 3 - to be taken into account, so some new treatment options may be allowed for people that have genotype 3 and are not able to receive the alternative, more toxic drugs," Geretti said. Bristol-Myers Squibb, which makes the drug, said: "Nearly 100,000 patients in the UK are thought to have hepatitis C genotype 3. This group could suffer severe treatment inequality from this decision. BMS will be working closely with Nice to see if a solution can be found, and hope that this decision can be urgently reassessed so that patients do not suffer."